I just returned from an idyllic two-week stay with three generations of my family in Greece, which I’ll be writing about at length in coming days. What was not so idyllic were the flights to get there and back. Torturous flights: hardly a news flash. Most flyers these days just grit their teeth and put up as best they can with the crowding; delays; security hassles; extra fees for checked baggage, “premium” seats, food, etc. ; lost luggage; and often chaotic airport scenes. After all, flying does (usually ) get us to where we want to go faster than other forms of transportation. But that doesn’t make it a pleasant experience. Bike tours are a great way to see the countryside and get some exercise. 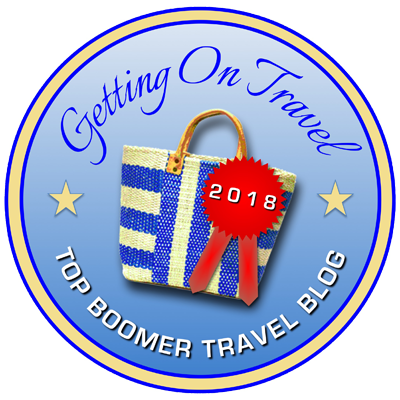 I’m always glad to run guest posts that contain valuable information for baby boomer travelers, and my friend Samantha Scott at StrideTravel.com has put together a good compendium of the most popular trends in boomer travel today — as well as some excellent suggestions for tour companies that will help you join in the fun. Samantha’s post strikes on many of the themes I’ve been discussing here for nearly three years now: that baby boomers are dedicated travelers and life-long learners, love to take river cruises and travel with their grandchildren, are embracing the wide diversity of tours now available — including adventure travel — and are far more tech savvy than is generally believed. National Grandparents Day: Take the Grandkids! You can bicycle along this canal with VBT. Photo from VBT Bicycling and Walking Vacations. It was news to me, but National Grandparents Day is on Sunday, September 13th. 50 million U.S. households are now led by grandparents, forecasting a continued travel boom by this large group of baby boomers. Today’s grandparents are far more active than their parents were, spending lots of time planning trips around specific activities. More grandparents are traveling with just the grandchildren, leaving the greandkids’ parents’ behind. 22% of all grandparents traveled with just their grandchildren in the past year. So hot that it’s up 30 percent over the past year. And boomer-led family groups are spending an average of $1,000 more per year than other travelers, according to findings at a recent family travel summit. The second TMS Family Travel Summit, organized by TMS Family Travel and Family Travel Consulting, brought together 38 travel journalists, editors, publishers and marketers to hear the latest research, discuss travelers’ needs, and determine marketing strategies for family groups led by retiring boomers. The multi-generational travel phenomenon presents both challenges and opportunities for those in the travel industry. But what, exactly, constitutes multi-generational travel?